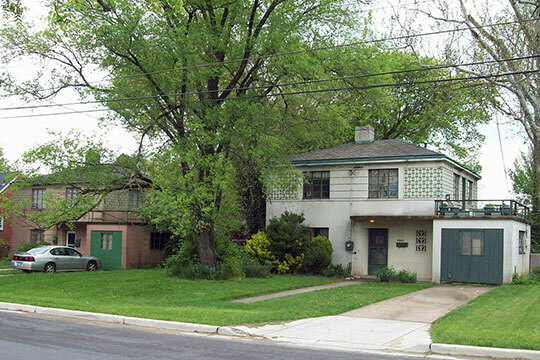 Silver Spring is a census-designated place of approximately 8 square miles bordering the northern part of Washington, D.C.
Photo: Homes in the Polychrome Historic District, ca. 1934, Silver Spring, MD. Listed on the National Register of Historic Places in 1996. Photographed by User: Pubdog (own work), 2010, [cc-by-1.0 (creativecommons.org/publicdomain/zero/1.0/deed.en)], via Wikimedia Commons, accessed May, 2015. The Silver Spring Post Office is located at 110 University Boulevard West, Silver Spring, MD 20910. Silver Spring takes its name from the mica flakes that gleamed on the bottom of a nearby spring. A suburb of Washington, most of its residents are Government workers. It has a modern shopping district and a few small manufacturing concerns, as well as the plant, classrooms and laboratory of the National Association of Cleaners and Dyers of the United States and Canada. In the laboratory, studies and tests of cleaning and dyeing methods and of the effects of solvents on fabrics are made. Works Progress Administration, Federal Writers' Program, Maryland: A Guide to the Old Line State, American Guide Series, University of Maryland, 1940.